CBO or Chief Business Officer is the top operating executive of the commercial companies or any academic institutions. They provide leadership and are responsible for deal-making in industries. And, in educational or research institutions, the titles such as director, vice president, and associate dean are often used for this role. Their job is to take care of financial, administration, and operations management of the institution. If you want to reach CBO’s of various organizations, you can buy Blue Mail Media’s CBO Mailing List which is compliant with GDPR and Anti-Spam law. This list is scrubbed regularly to keep it fresh and clean. Stop chasing the wrong audience with inaccurate data. We provide you the most-current and deliverable database that helps you to reach the right prospects at the right time. Blue Mail Media offers the best email for the successful execution of marketing campaigns. 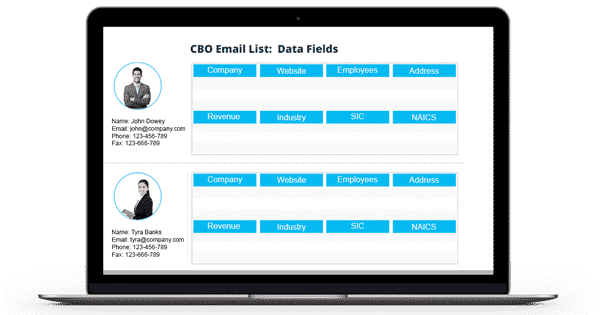 Likewise, it provides CBO Executives Mailing List using which you can reach all the chief business officers in various regions across the globe. Be it USA, UK, Europe, Russia, Africa, North America, South America, Asia, or others; you can have seamless interaction with the potential clients regardless of boundary constraints. You are free to customize this list based on your business requirements. With this customization option, you can reach the right target quickly with no hassle. We collect the data for CBO Executives Email List from various authentic sources such as yellow pages, business directories, conferences, surveys, government records, trade shows, and more. Also, our team updates it for every 90 days to keep it free from errors and redundancies. They make thousands of verification calls and send thousands of emails to provide you with the most accurate and reliable data. Hence, we can guarantee more than 90% deliverability rate for our email list. Avail our CBO List with so many features if you wish to boost your conversion rate and ROI. You can either dial 1-888-494-0588 or send an email to sales@bluemailmedia.com for more information! Our team of data scientists, analysts, and experts constantly dig out the most qualitative data to power your multi-channel marketing strategies. Also, we ensure that our List of CBO Email Addresses remains accurate and updated by making thousands of verification calls each day and sending out verification emails.